“Ho ho ho!” is immediately replaced by “hot! hot! hot!” when you spend Christmas on the Caribbean island of Curaçao. Oh yes, the most wonderful season of the year also takes place on our tropical island. We love Christmas trees and decorating our homes with multiple strings of colorful lights. There are, however, some differences to the usual Christmas sphere that you’re probably used to … instead of winter snow and hot chocolate, Curaçao offers an endless summer sphere with beautiful white sands, crystal-clear waters, and refreshing cocktails! If you’re planning to visit Curaçao during Christmas time and you’re not convinced yet… then take a look at some of the best Christmas activities on Curaçao. You could say that people on Curaçao are the world’s biggest fans of fireworks. Already since a young age, children go outside with their parents and friends to experience the many firework shows around the island. Perhaps the reason why people look so much forward to Christmas has to do precisely with the strict legislation around fireworks. According to law, all businesses that want to sell fireworks need a special permit (not so easy to get) and they're only allowed to sell them from the 27th till the 31st of December. That means that in all transparency with the law, locals are only allowed to buy and throw fireworks 5 days a year. Many establishments do follow the process to obtain this permit and there is a special Firework Show Schedule published each year which people follow religiously as each establishment competes to be the best show of the year. One of the biggest fireworks shows takes place at the end of December at the Pietermaai District, where the streets are covered for hundreds of meters by a seemingly red carpet full of fireworks. These are known as “Pagara”. Besides the tremendous sound that wakes up even the heaviest of sleepers and the astonishing view of hundreds of fireworks exploiting simultaneously, “Pagara” is especially important on Curaçao as it believed to send away bad spirits. If you’re on Curaçao at the end of December, we recommend paying a visit to the Pietermaai District. The show always starts around noon. 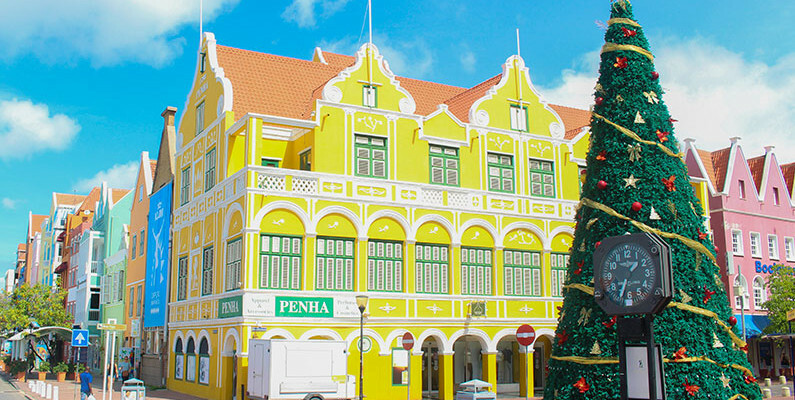 Pietermaai is one of the 4 districts of Curaçao’s capital, Willemstad, and it is perhaps the most colorful and festive area of the island. In the 2nd week of December, the whole district will become one big Christmas street party with live music, drinks, treats, and handmade items from local vendors. The party usually starts in the afternoon and ends late at night. If you manage to go, make sure that you have enough energy and are comfortably dressed to show the locals your best Christmas moves as the sun sets next to the beautiful Caribbean Sea. In 2019, the 2nd Edition of Chobolobo’s Winter Village will take place in the 19th-century Chobolobo Mansion, the home of the world-famous Blue Curaçao Liqueur. With the Curaçao Liqueur Distillery, beautiful architecture, and cozy courtyard with a bar area and some of the best cocktails on the island, The Chobolobo Mansion is one of the most popular and visited places on Curaçao, both among tourists and locals. The Chobolobo Mansion promises a Christmas Fair for the whole family where over 30 local vendors will present their best Christmas decorations, gifts, jewelry, apparel, and much more. The fair starts in the afternoon and there will also be live music and delicious bites and cocktails. If you’re on Curaçao in the 2nd week of December, Chobolobo’s Winter Village is the place to be. The best part is that the entrance is completely free. If you want to come to Curaçao just to enjoy the sun and beautiful beaches but you still don’t want to miss out the opportunity to experience a local Christmas Fair, then the Christmas Fair at Jan Thiel Beach is the place for you. In the 3rd week of December, this famous beach will welcome lots of Christmas stands that - combined with live music, and typical drinks and bites - will ensure the perfect evening by the sea. Jan Thiel’s Beach Christmas Fair starts in the afternoon, so make sure you’re on time to see the sunset! Holiday Ham, or “Ham di Pasku” as it is known locally, is one of the favorite items cooked during the holidays on Curaçao, and also Aruba and Bonaire. This pork ham is marinated with honey, mustard, butter and salt and it is usually cooked in the oven with pineapple slices and small cherries on top. A true favorite on the island, you’ll see the locals eating “Ham di Pasku” from morning till night. An “oliebol” is a Dutch variety of dumpling that is made using an ice cream scoop of dough that is deep-fried in oil. The dough is made from flour, eggs, yeast, some salt, milk, baking powder and it typically contains raisins as well. As soon as it is fresh out of the deep fryer, it is served with powdered sugar. If you walk around the city center and smell a delicious donut-type of scent, follow your nose and buy yourself an “oliebol”. You won’t regret it! Originally from Venezuela, an “ayaka” is what you’ll most likely be served if you sit down for a meal in Curaçao around Christmas time. An “ayaka” usually involves a mixture of beef, pork, chicken, raisins, and olives wrapped in cornmeal dough and folded within plantain leaves. This unique mixture is then tied with white strings and boiled or steamed for a couple of hours. The process of making an “ayaka” is rather long, and that’s why most families get together to prepare “ayaka’s” while they listen to typical Christmas music, share drinks and take the time to also play a game of dominoes. If you’ll be celebrating Christmas on Curaçao, make sure to wear your comfy slippers, stylish sunglasses, and Santa hat. Don’t forget your sunscreen lotion either! Go out, have fun and remember the phrases “Bon Pasku” (Merry Christmas) and “Felis Aña Nobo” (Happy New Year)!